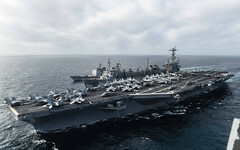 The three ships of a U.S. 3rd Fleet Pacific Surface Action Group reunited June 27 after several months of dispersed theater security operations around the Indo-Asia-Pacific. 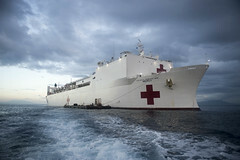 USNS Mercy (T-AH 19) and the multinational Pacific Partnership team arrived in Legazpi, Philippines, June 27. Named to honor President Theodore Roosevelt's Great White Fleet, the Navy's Great Green Fleet is ushering in a new era of energy innovation. 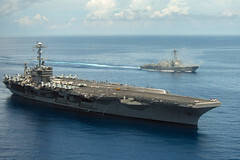 The John C. Stennis Carrier Strike Group crossed the International Date Line June 25, returning to the U.S. 3rd Fleet area of operations following more than four months in 7th Fleet. 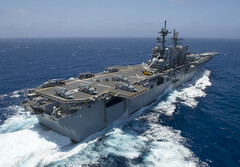 Four multinational groups of ships are transiting toward Hawaii from the eastern Pacific and western Pacific Ocean for exercise Rim of the Pacific (RIMPAC) 2016, which begins June 30. 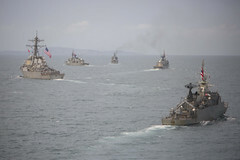 Twenty-six nations, 45 ships, five submarines, more than 200 aircraft and 25,000 personnel will participate in the biennial Rim of the Pacific (RIMPAC) exercise, June 30 to Aug. 4. 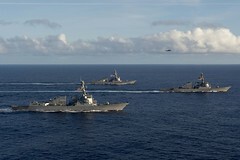 The 22nd annual Cooperation Afloat Readiness and Training (CARAT) Thailand exercise concluded June 22. 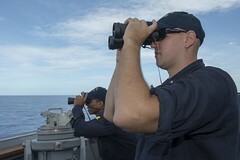 The guided-missile destroyer is on a routine patrol in the South China Sea as part of a Pacific Surface Action Group deployment to the Indo-Asia-Pacific. 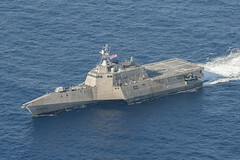 The littoral combat ship is scheduled to depart Naval Base San Diego June 22 on an independent deployment to the Western Pacific. 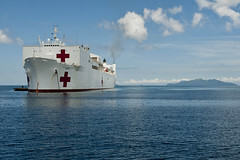 USNS Mercy and the Pacific Partnership team departed Timor-Leste June 21 after two weeks of subject matter expert exchanges in civil-military disaster response preparedness, cooperative health engagements and engineering projects.